In Colorado, you don’t have to look far to find a classic restaurant serving up some of the finest French dining you’ll ever try. These top-notch eateries vary from upscale French establishments to laid-back bistros and cafes. Enjoy crepes, soups, breads and French desserts at these 10 best French restaurants in Colorado. Find both incredible cuisine and a delicious bakery at Marigold Cafe & Bakery in Colorado Springs. The French bistro-style environment at Marigold Cafe has welcomed guests for more than 19 years. Enjoy made-in-house bread along with fare like pasta, pizza, meats and many more French-inspired cuisine. Known as one of the best French restaurants in Colorado Springs, La Baguette French Bistro has authentic French and European items on its menu. 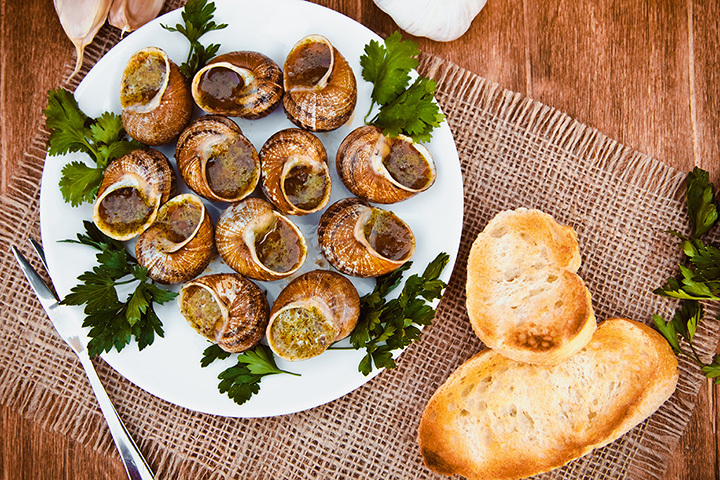 From French onion soup to garlic butter escargot, La Baguette will not disappoint those craving well-made French cuisine. For those seeking a great wine menu to pair with delicious French fare, head to Bistro Vendôme in the Mile High City. Find 65 different French wines here along with French foods like escargot, steak tartare and of course macarons. Brasserie Ten Ten is a French bistro found in downtown Boulder. Head here for the perfect brunch menu complete with croissants, eclairs, and Eggs Benedict. Or choose among the other delicious menu options like raw oysters, French onion soup and steak frites. This laidback Paris cafe serves a variety of crepes along with espresso. From unique crepe options like gluten-free and vegan crepes to a variety of cheese and soups, this little French cafe is the perfect spot to enjoy a great French meal in a welcoming environment. This fancy French restaurant is perfect for date night while visiting the gorgeous mountain town of Vail. Unique menu options are always being added to this ever-changing menu. Enjoy well-made seafood and duck along with classic French dishes infused with Asian flare. La Tour Restaurant & Bar is also a great place to find your next favorite wine, since the wine cellar here houses over 500 different wines. This elegant restaurant in Cañon City serves specialty drinks, house-made breads and pastries and classic French dishes made with lamb, duck, veal and beef. No matter if you’re looking for a great coffee or the perfect French onion soup, La Petit Chablis is a great place to visit for a pleasurable French drink, snack or meal. For those seeking a delicious French meal in the town of Aspen, visit La Crêperie du Village. If the weather is warm enough, sit on the outdoor patio and sidewalk tables. This romantic restaurant is perfect for date night or even a business meeting. Enjoy a menu that is loaded with items like fondue, cheeses and crepes. French-inspired food is found at Cafe De France. Complete with a beautiful dining area and a charming patio section, Cafe De France has grown into one of the best French hotspots in the Greenwood Village area. Enjoy espresso drinks, plenty of French pastries and other French classics infused with an American twist. This upscale French restaurant in Denver has an incredible menu with dishes made from local and farm-fresh ingredients. Mixing both American and French cuisine, Coohills serves seafood, breads, cheeses, meat dishes, salads and divine desserts.